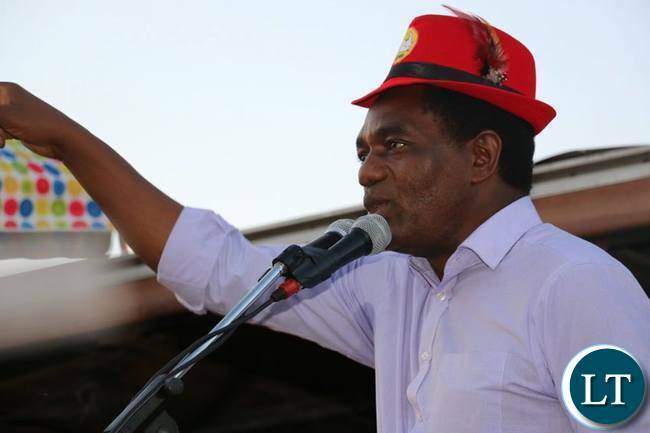 UNITED Party for National Development (UPND) president Hakainde Hichilema has said action must be taken to close the gap between the rich and the people in Zambia. Mr Hichilema said in a statement yesterday that each citizen must be given the opportunity to participate in the economy and improve his or her situation in life as a way of closing up the gap. He said it was the responsibility of the government to ensure that the benefits of growth were shared. Mr Hichilema said it was for this reason that UPND’s 10 Point Plan has a big focus on reducing inequality. He said his government is going to tackle inequality by supporting the vulnerable and disadvantaged that were struggling to find jobs and access services such as education and healthcare. “We will support youths through training initiatives and working with employers to open up apprenticeships and skills transfer opportunities,”he said. Mr Hicilema said UPND is going to ensure access to education was equal for the girl and boy child. He said this would ensure that the government tackles the issues that mean girl child school attendance remains lower such as child marriage, teenage pregnancies and expensive fees. He said his government is going to lower food prices by increasing the productivity of our farmers. He said corruption sees a huge percentage of the country’s wealth end up in the pockets of a few but there would be no sacred cows in the UPND government. He said Zambia’s resources were for Zambians not a few select individuals. “These are just some of the things we will do. To those who ask why previous governments have failed to eradicate poverty, we say it is because of a lack of political will and corruption,”he said. Father Bwalya should be worried beacuse his days in PF are numbered. Rupiah is in the bedroom of PF already and Bwalya is in the pantry. You will be thrown out of PF soon ba faza walya. Rupiah has not forgotten your killing of an innocent chicken. Kikikikikikikiki,yaba. Ba HH bena kuwayawayafye. When you hear him delivering his campain message, he sounds like someone reading from a list things the PF has or is already implimenting. The only thing he can do that the PF cannot do is paying all those BP retirees who’ve not been paid there terminal benefits for more than 20 years by Regina Saturnia a company in which he’s a major shareholder. HH is a typical capitalist and all his friends are capitalists.What HH is talking about here is not possible. Let him just ask for votes than him cheating us. We know he has been fighting to get to state house just to enrich himself and his business partners at the expense of Zambians.Only a fool can buy to this nosense. This Kaponya who can he cheat? This bankum is just a crooked business dealer with a shady past of selling government assets. Why is it that your maids and garden boys still get K400 which is below the minimum wage? Have you closed the gap between your rich self and your workers? Proud elitist F0OL. Sorry mwandi Kudos. Ladies and gentlemen of the forum, Kudos suffered a stroke and can only type with one finger and read using one left eye. UPND is too much for him. Tired of reading your negative and hate comments toward your fellow human being………. Bufi! How are you going to do that when the government coffers are empty. Where are you going to get the money? Such campaign messages are meant to dupe people. Once in government HH will start telling other stories. Iyo….Iyo….this and that. Zambia is a very rich country, there is potential to make money every where. It is not just about borrowing. PF failed even to launch page numbers for their manifesto! Kaponya (HH) has said it himself, he doesn’t mince his words. In his small rotten brain, the lack of political will and lack of corruption make leaders fail to eradicate poverty. Indeed it’s a lack of political will and corruption. PF corruption and political will. Where is the unaccounted $500 million kariba rehab money??? Where is the unaccounted 25 million US from KK international airport.?? Where is the over 300 million US borrowed on multiple times in the name of lusaka water and sanitation?? Soon kudos and you PF thieves will be able to give zambians these answers from the high Court, unless you will not be packing your bags to go back. @Mr. kudos, Ala uletekanya swenke, your so many postings and unusual comments every time HH says something is abundant proof of the hatred that rests at the helm of your heart against the man. But that does not mean HH is failure going by your unusual comments. The negative comments you pass speak volumes about what kind of a poorly minded person you are up there and you need to reform no wonder you are just a skull without brains. Probably, I would not be wrong to assume that you are just a kaponya, a drunkard and a visionless chap like your kachasuman at state house. This country cannot move forward with empty tins like you whose thoughts and hidden agendas belong to the dustbin. President Edgar Lungu has never insulted (HH) as a FreeMansion. But your Kaponya leader has labelled our Republican President a ‘Kachasu man from the tavern’, calling ordinary citizens ‘Morrons’ and FO0LS. Its now campaign time where the ‘sharper’ the tongue, the more the votes. However, it takes common sense to distinguish what is practically possible, promises notwithstanding. Let the best man win! Beats me too ! Why not just resign from PF and lie low than dance with the devil himself. ZWD and HH really hated Sata even in death they still hate him. Why has MSata who was called ‘Msata nyoko’ by GBM barely a few weeks joined GBM and HH ??!! When people throw their morals and values out through the window, you see such things as displayed by Mulenga’s deception. But we can help these people come back to their senses on August 11. Vote wisely for the Sonta po team and let these prodigal adults return to the PF in August. How can the sata family stay in PF which is being over run by RB, Dora Siliti and Frank bwalya?? What is wrong with RB, Dora and Frank supporting PF? They never wished mr. Sata ill unlike the UPND. I can not understand for the life of me how Mr. Sata’s Son and Widow would find it normal to support a man who insulted him on a daily basis. Is it for money? or hate for president Lungu. RB and his gang hated sata with a passion, we all rember Dora insults directed at sata and the Pf. Some times the intrests of country have to come before party or tribal affiliations. People have seen HH being a more capable leader than lungu. People of Zambia do not be FO0LED by this Kaponya (HH) with a forked tongue of a serpent. Have you ever noticed the way he flicks his tongue like a lizard whenever he speaks. What beats me is the pact Nevers has made with the Devil himself !!!! Just tell us why we have 22 % inflation and cholera ravaging our people, with civil servants having their salaries delayed all the time while lungu spends close to 3 million US entertaing people at heros stadium. First start by returning back the money you stole from our mines then pay the poor BP workers what you stole from them. “Reducing the gap between the rich and poor” my foot ! You fail to pay your own workers sufficiently together with Fat Albert who even beats his workers yet you want to pretend you will share their pain. The ‘humbleness’ people like in EL is the simple life he leads and has no affinity for money. If GBM cared why hasnt he reduced the price of his Mealie Meal ? Selfish Capitalists ! Latest rumors indicate that Kaponya (HH) and his mafia Cartel of Miles, GBM, Scott Mmembe Inc have shares in Manda Hill shopping mall. They recently hiked the rentals to cause hunger and anger in the workers at the mall. They were trying to show that the economy is bad and Lungu is failing the people, that investors at Manda Hill are pulling out. This is the Armaggedon, mayhem and havoc these massons talked about recently. Hahaha…..if not pathetic desperation by PF theives who now see their free ride on the looting of the nation comming to an end, this would be very funny. By giving a single zambian a meaningful job, that gap is already reduced. Spaka like lilo – At his farms? You mean jobs are just given like handouts? Where is he going to get Jobs? You think HH can manufacture jobs. Foolish UPND caders. Your worshiping of this man will lead u to destruction. You have all school and GRZ uniforms made in zambia, army, ZAF, ZNS. Do away with PF ministers contracts to have these imported. Well spoken. That’s exactly how to do it. Its amazing how seemingly intelligent bloggers on this site choose to pretend and sound so dull, and they call it politics. Zambia has MORE natural resources than any single European Country you can name. And yet these pretenders prefer handouts from here in Europe, which handouts are digging and yoking our mother Zambia deeper into debt for the next generation. Anyone who is oblivious to long-term consequences of borrowing without a tangible plan to stimulate our economy is not fit to be a leader. To the PF one doing well financially is only possible through corruption, and the country developing is only possible through borrowing. Umuntu wa mano teti apape pantu mu PF mwafule fikopo starting from Lungu himself up to the last person. E mulandu kuli bena fyonse fyalikosa, teti ficitike, kano bu cakolwa ebwayanguka, ukunwa capwa. With such people at the helm of leadership, where can the country go. Ifi fine fikopo fi bena Kudos and the like butungulushi nshi bengapela ku calo aba ba mulya masuku notuminwa mu mpanga ? they are just there to always give support to mediocre leadership, visionless leadership with no direction. If HH store something, why can’ t he be probed because there are law enforcement agencies ? If he is free, that means he is innocent abaiba balibakaka. Ba skull and group muletontonkanya. Not bucilandelande fye kwati mashilu. Kudos even Mukuba Mall is his and of late things have become very expensive at this mall. You have just given me the answer. This Hell H will stop at nothing. We can eliminate such cold hearted mercenaries by voting wisely on August 11. If you read the real behind scenes politics very well, you will realise that government under President Lungu has been tightening the loose ends where there was rampant corruption, pilfering and embezzlement by Cartel crooks like (HH), GBM, Scott Mmembe, Wynter and Miles. Lungu won without their support, only with the support of the Zambian people. He could afford discarding them unlike the loyalty President Sata had to maintain. Now the Cartel crooks have all jumped to UPND and Kaponya (HH) is too occupied with getting to State House because this is his last attempt. They will play all sorts of tricks to try to destabilize the economy but we will prevail. @ Mr. Kudos, you are doing great man. Continue hammering them!! I have enjoyed your contributions. To be honest I can’t vote for HH, he lacks the charisma of a politician, surely he does not appeal to me. Kuwaya waya fye. Hammering who? I thought you say UPND is only popular on social media. Now the grassroots have moved towards UPND and you are here bwating! Mr incoming president, lately your litany of promises are increasingly sounding hollow as you inch close to plot one; more like debating club statements from some high school. Please try hard to substantiate your claims. Do it like Kaunda who promised to create jobs … in Mansa by creating Mansa batteries and Kawambwa Banana Scheme; in Chipata through the bicycle factory; in Livingstone via the ITT and Motor Assembling Plant; in Kasama through Kateshi Coffee, etc. Those were believable promises, kind of assurances. Emulate KK. At this rate your promises are another version of 90-days PF rant and lack conviction. But to be fair to PF they have created an unassailable legacy of being infrastructure giants and transformed Zambia in that regard. I thought the company HH was a shareholder or worked for did evaluations during privatisation. V. Chitalu was in charge of privatisation and the Zambian government sold the government owned companies. Then the government and citizenry used the money. So HH is in the equation but was just a constant. And now that he is vying for the highest office of the land he must explain how he used his salary or dividends, how his cows were giving birth to multiply, how he sold the increased herd and built shoping malls, invested in this and that. Then it more difficult to be a president with that background than those who sat in those cabinet meetings and made those decisions. Or more difficult to be president of Zambia while you are a successful individual than those with fraud convictions…. Zambia is one of the richest countries on earth. For every single meaningfully job created (not the casual jobs under PF and their overpriced projects where they stole most of the money) that gap between rich and poor is reduced. Zambia is a rich country, let the revolution begin in August by saying to no to corruption, mediocre managment and chipantepante GRZ. The why and the what we know but with you Mr. HH we just never get the “how”. Personally, I do not think there is a problem with the gap between rich and poor, rich people are rich because they work hard or because of some family dynasty etc, the aim should be that we improve the definition of poor and ensure that “poor” people have the relevant basics and be able to send their children to schools. The “How” is all in sound solid managment with out the scourge of corruption. Just as an indicator of corruption ravaging Zambia through PF, most scholarships meant for poor deserving zambians end up with the PF children and their relatives like in the case of given lubinda and his daughter in Russia. Or the case of kambwili telling PF cadars in parastatals to employ relatives only. The missmangment is clear for all to see, Lungu and PF only open shopping malls. Firstly, corruption cannot be seen, it must be proven in the courts of law. I do not work with hypothetical situations. I really think HH needs to start mentioning the “how”. You mention prudence and transparency, that is not enough to uplift the well-being of Zambians. How can Zambia grow its GDP without the creation of infrastructure? What is wrong in mall-construction? And let us not be misled, the Government has not built any malls, these malls are built by private entities and pension funds (of course I acknowledge that NAPSA bends to govt’s demands). Money used for scholarships is negligible, the hidden truth is that can only sustain itself when the public service is cut by 30%. To you the issue of scholarship corruption might seem negligible, but to poor bright deserving Zambian students aspiring to lead our nation, this is devastating to see rich PF children getting the scholarships, this creates a vicious cycle. On corruption As the situation stands now, the whistle blowers who see corruption are told to provide evidence by this PF ACC. You can see the money is unaccounted for but we are being told to provide evidence. The custodians of our wealth and the ACC are the ones with the evidence but fold their arms. One one doubts development needs infrastructure, since we spend all that money on infrastructure why then are we going back begging to the IMF??. @Spaka- I guess I understand your point. Thank you for being gracious in your responses. Hell H, how can you state you will change the economy with Government mostly comprised of people that helped bring down the economy with their Kaponya Sata ? What good will Kaseba bring when you yourselves questioned why the ‘Office of the First Lady’ was allocated tax payers money for Kaseba to fly around. You questioned GBMs firing of ZAF officers for refusing to award him tenders. If UPND maintained its Top Brass of Nkombo et al, we would have been looking forward to new governance but Hell H has taken up the same old PF rot of GS GBM Maseba etc etc. What will all these do differently this time ? Schools and hospitals are being built all over the country and jobs created. “We will support youths through training initiatives and working with employers to open up apprenticeships and skills transfer opportunities,”he said. Skills Centres are being built all over the country. “He said his government is going to lower food prices by increasing the productivity of our farmers.” This is already happening through FISP and Solar Milling plants, despite opposition from frustrated Cartels. Unless HH is blind, we will not forgive him for thinking we Zambians are fools. HH tell us something new, something that is not happening. Don’t give us the impression that you have run out of ideas, or have you? Has the PF pre-emptied your campaign massages? SONTA! “He said his government is going to lower food prices by increasing the productivity of our farmers.” This is already happening through FISP and Solar Milling plants, despite opposition from frustrated Cartels. Unless HH is bl1nd we will not forgive him for thinking we Zambians are f00ls. HH tell us something new, something that is not happening. Don’t give us the impression that you have run out of ideas, or have you? Has the PF pre-emptied your campaign messages? SONTAKO FIMBI! @Disgusted- I agree, and not to mention, we never see actual graphs and numbers but we only hear platitudes and the same rhetoric that even I can come up with. Why can’t he mention how his tax plans will look like, how many more skills centers he can build, how much debt he plans to get rid of. Food prices influenced by many other factors. Current food prices are high because of exchange rate fueled inflation which is unlikely to improve until 2018 when China’s copper stockpiles have depleted. This is a fact. Politicians will make even good things look bad, infrastructure is necessary to create a base for increased GDP. Other countries that have embarked on such projects have suffered more than Zambia is. HH supporters, how did he get rich? How did he start? How come he become rich after privatization? How and when did he start his business? How did he start….by buying and selling cows while still at uni. He even built a house for his mother at that time. How come he became rich after privatisation…..before privatisation HH was already well on his way to being rich. With or with out privatisation he was still going to be rich. @Spaka. No that is not true my man. I agree that he is a good business man but it is not a lie that he got rich from privatization under Chiluba. HH was not well on his way to getting rich because he was an advisory consultant at Grant Thornton. Auditors do not just get rich, ask anyone who is. Most of HH’s money has emanated from his affiliation with Anglo American Corp. which sold assets to Sanlam which offered HH and some friends who executed the deals some shareholding. I do not say that his role in privatization was unlawful, it was just unpatriotic as these companies were sold for nearly nil values. maybe he was at the right place at the right time, put another way, would you rather those shares or companies found them selves in foreign hands ??? I am a staunch PF supporter and it is good to see the PF team regrouping in the guise of UpaNDown. All UpaNDown ideologies and perceved policies will be engulfed by PFs, and there will be no HH economics at play in this nation. LONG LIVE PF!!!!! Ka boss ka ba under 5 and yo friends pls go and pay the money you are owning the BP company the families have suffered enough. Ka hh and friends give the people what belongs to them. And PF pleas stop this erratic time schedule of paying civil servants on time, even salaries are now like a load shedding time table. You put a lot of people in problems by not paying on time. You can’t talk about reducing poverty when you hh steal from the poor,this is hypocrisy at its best. Ehhhhii…coma Thesii guy HH is just to advanced it seems…..let lead Zambia maybe we have a chance…. I did not know the circus was in town. There are clowns all over. Even the die hard PF kaponyas on this blog extoll the expertise of economic managment by HH, all they have spining in their heads is “matrix, matrix….” as they stand is awe and shock. To them getting rich means corruption, to them developing a country means borrowing. May I ask I question to those men and women who say: HH has no experience to lead this country, question is: Which university in the world CV teaches one to be a President? Did Mr Edgar Chagwa Lungu go to this university or indeed the rest of the former Zambian Presidents, alive or dead? Secondly, this sontapo po PF slogan, I believe there is always one President in a country at one given time, so how does the PF expect HH and indeed the whole opposition to sontapo when they are not the government who control financial bourse? I think the slogan is indecent and vision less. Spaka like lilo. I dont think even you believe what you are saying. His story does not add up. If you read the story of rich people in SADC like Mostepe or Ramaphosa their stories start from somewhere. These guys we know it was through BEE. Even Katumbi’s story (shade as it maybe) is more believable than HH story. Ok so he sold cattle and ended up buying shares in Zambeef, Sun International, Manda Hill and many others? In a space of 10 years? HH like the Russian Oligarchs took advantage of privatization and cut deals. As someone who is in business, I find it difficult to believe his story. Unlike most riffraff who just make accusations about HH’s rise to prominence, you sound like a rational guy. So, here are 3 irrefutable points in support of HH. 1.) Late President Sata, when he was still a vindictive King Cobra, made it his mission to retrieve all assets dubiously acquired by individuals and organisations during MMD’s Govt. In particular, he targeted to get to the bottom of HH’s wealth. You know the outcome of that effort. Underestimate vindictive Sata at your own peril. If however you have any shred of evidence whatsoever that he did break the law in any shape or form, please please please report him to PF Police who would relish such an opportunity. HH has nothing to hide, infact all those who were intent on smearing him have being trying to dig up skeletons for the past 20 yrs. That has included 3 presidents, sata, RB and now lungu with all state marchinary to try to find wrong but all they come up with is privatisation knowing full well he only carried out part of a work assignment and the decisions were left to FJT and his cabinet including sata. Doesn’t add up? Ba LT are blocking my response to your comment. Whats the problem ba LT? rates long before the privatisation. Cont’d…. by the time you get to the last square (square No. 64) on the chess board? The answer is staggering!. Exponential growth, if well managed, is like a trick. This is what our young entrepreneurs should be focusing on and debating on. May I ask a question to those men and women who say: HH has no experience to lead this country, question is: Which university in the world CV teaches one to be a President? Did Mr Edgar Chagwa Lungu go to this university or indeed the rest of the former Zambian Presidents, alive or dead? Secondly, this sontapo PF slogan, I believe there is always one President in a country at one given time, so how does the PF expect HH and indeed the whole opposition to sontapo when they are not the government who control financial bourse? I think the slogan is indecent and vision less. HH has been campaigning on the premise of being a better economical manager and successful businessman unless you have not heard that…The essence of SONTA is based on the fact that you do not need to be President to show the contributions to the economy e.g. Dangote a foreigner has put up a cement plat that has contributed to the reduction of cement prices, whereas the so called businessmen are saying they can only fix things once in power…Great Bag of Maize (GBM) even owns a milling company and yet mealie meal prices are much higher than Cement….and he has 10000 tons of maize he wants to export at the expense of Zambians…SONTALICIOUS chabe! Lungu has a law degree from UNZA. HH studied at UNZA. So did Mwanawasa. Chiluba was uneduacted so was KK. Don’t be fooled! THE GAP CAN NEVER BE CLOSED. My mother Shanti left my father Kishore in Mazabuka in 1979 and ran away to Choma with our garden Boy Simulonda. Such profound differences between rich and poor resonate with me decades later. Simulonda extracted revenge from dad by stealing his wife for being underpaid. That is the history of Zambia. HH should first pay the pension contributions of ex BP workers whom he is failing because of greed. Come on HH tell us something new. I sat for a moment thinking you have nailed it already after reading the bare statements above. Behold three quarters of what you’re saying is already being implemented. Come on HH think! come on man! Tell us something new. That is not the froward you preach to Zambians now, is it? That is stagnation we are already there. Bring new ideas. You know what? You HH are uncoachable. What’s the point of changing Government if you sounding like them? Where were you when Lungu was nicknamed “Me also” after listening to UPND’s plan? 1. Did you noticep how quiet HH was during the week of AfDB meetings in Lusaka of economists and financiers? He did not want to open his mouth and expose his incompetence in economic and financial matters to fellow economists and financiers. He heard for himself how Africa including Zambia is facing economic challenges largely caused by external workd economic factors and climate change. As soon as the experts left Zambia he is at it again sharing his limited knowledge and pretending to be an expert among ignorant Zambians. 2. Where he will get the money from to finance his plan since according to him, the country has borrowed too much and has no capacity to borrow more. Hasnt he told us that the debt is unsustainable for the country? So is he going to print more kwacha? 2. He is not telling us the fact that in order to implement his plans he will need to use the roads, schools hospitals etc built by PF. He will find these ready and will not havevto borrow money to build roads again for a long time to come. His plans can not be done without the basic infrastructure. 3. Even campaigning he is using the same nice roads, when his members fall sick they go to the hospitals clinics built by PF. Kuwayawayafye ba HH, just sonta pali ba PF iwe! Why is every thing about borrowing with PF ? Zambia is a rich country and with proper management, does not need to borrow for everything. And at what cost to the nation have those nice roads cost us?? Why is Zambia running back to the imf ?? Unlike most riffraff who just make accusations about HH’s rise to prominence, you sound like a rational person. So, here are 3 irrefutable points in support of HH. Cont’d…..by the time you get to the last square (square No. 64) on the chess board? The answer is staggering!. @ Terrible and Mr Kudos; Tell me where your clueless Lungu will get the money from to fix the Economy he broke down?And also the money to pay the country back which they ve been stealing in one year.Even Here is the difference:with HH;he ll only ve to look for money to fix the econmomy(besides he is respected & trusted wolrdwide),so businesses ll flock to Zambia when he takes over.While your Lungu,will first ve to look for money to repay the Eurobonds and more borrowed money from donors.And mind you,we as Zambians dont owe these donors,they must take their money from the person they gave it to(Lungu and Chikwanda).And finally,u are also admitting that you PF Kaponyas ve destroyed our country-Ba swine. But HH is the one helped Chiluba Government to destroy Job in Zambia by advising GRZ wrongly in selling ZCCM and other GRZ Companies in the early 1990’s. The promising is one and implementing is another. How is going to do what he is promising no one knows…………….vyakulola vye.at our institution every Tonga is UPND and alot of other tribes are in UPND but no Tonga is found in Other Parties other than UPND why? That is why I will never vote for HH. How can UPND deny that you need infrastructure to develop? Why is he lying to clueless Zambians that they will pay debts for yes to come? How will HH deliever what he is promising with broken roads. I would have voted for him at least if he had said PF has done its best but said we can do more. Its nonsense to say roads, bridges, airports, hospitals, clinics are not needed. If you know anything about economics, nothing wrong borrowing for infrastructure. What is wrong is borrowing for consumption. Errrr….When did HH say roads, bridges etc etc are not needed. ??? From what we understand, Upnd has articulated that while targeted crucial infrastructure is essential, this must be balanced out with the immediate health of the economy. What is the immediate economic benefit to a to a sick economy of Tarmac roads in the Combony ?? So that jobless youth don’t get their feet dirty ??. At least 1 billion dollars should have been spen on job creation, but it seems the construction contracts were too sweet. ati il breach the gap between the rich and poor,how? im not saying its impossible,I believe in possibilities as long as u put your mind to it,my doubt are in other people who make promises bigger than them,even the bible says to know them by their fruits,if you cannot be trusted with little,how would u be trusted with more,ati breaching the gap,awe kwena 10point plan iyo taijailika.we have had a small number of individuals who have been asking to be given their pensions,if you pay them ,dont you think thats one way of breaching the gap?